Vegicide at home. And there's a mushroom under the round of goat's cheese... I do this sort of thing occasionally. I've been off the net for so long I've no idea whether this is common knowledge. Dr Lutz was a core influence on me. His writing is so down to earth, pragmatic, sensible and thought provoking. I don't know what else to say. This post has been lying around for a while so I'll just stick it up before getting on to IDE and potatoes. You sometimes have interesting conversations in reception. A lady commented to me that she had no trouble getting arthritis meds in to her dog, some difficulty with antibiotics and that there was no way that she could persuade him to take the tramadol which had been prescribed as a supplementary analgesic for his arthritis. I mentioned that he might not find the psychotropic effects of tramadol pleasant. A bit like morphine, not everyone finds the effects enjoyable. She concurred about the effects of morphine. It turned out that she had once been given morphine after surgery and had lost her automatic ability to breathe.... A sort of iatrogenic and thankfully temporary Ondine's curse. More poetically here. In her case the solution had been that a nurse was assigned to sit by her bed and remind her to take a breath whenever she forgot, until automaticity of breathing returned as the morphine wore off. It's a rare side effect. It started me thinking about control systems. The pancreas monitors blood glucose and responds with insulin and glucagon. It has a generous nerve supply with a whole host of neurotransmitters affecting insulin output. There are also glucoreceptors in the aortic bodies feeding information to the autonomic nervous system. There are, not surprisingly, nuclei in the brain which have glucosensors. There are probably insulin receptors in the brain too. I think it is just worth pointing out that I have absolutely no problem with the fact that the brain controls blood glucose. Not the pancreas, not the liver, not the adipocytes. Long term stability needs brain input. You could probably say the same about body weight. But I doubt very much that the brain is central to the bulk management of metabolism. You would hardly expect a regulatory system such as the pancreas/liver/glucose axis to be intrinsically unstable and only kept functional by continuous and aggressive brain intervention. Metabolism ought to be largely self regulatory, with fine tuning by the brain to meet specific conditions. There is clearly a regulatory set point for the control of breathing. There is also one for blood pressure, blood sodium, potassium, pretty well everything else. I manipulate many of these daily to earn a living. Why not one for bodyweight? At the moment I have an insulinocentric view of metabolism and bodyweight. Insulin appears to explain a fairly large chunk of weight control issues. It doesn't intrinsically need a set point concept, but there is every reason to accept some brain input to determine bodyweight. But the idea that the brain can over ride the obesogenic effect of a diet which requires chronic hyperinsulinaemia to maintain a semblance of health is very hard to accept. It was working through these concepts that I dug out a fascinating paper on leptin and blood glucose emailed to me by Stephan a little while ago. I finally got to read it in depth last week. The streptozotocotin diabetic rat strikes me as a pretty good model for type 1 diabetes. It looks to be a pure beta cell failure model, ie it lacks the stupidity of considering metabolic freaks such as the Otsuka diabetic rat as in any way representative of any form of human type 2 diabetes. I have time for STZ diabetic rats as being a model for type 1 diabetes. STZ produces acute, persistent and profound hypoinsulinaemia. 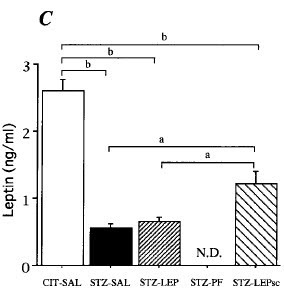 The researchers made some rats severely diabetic with STZ (BG > 400mg/dl), then infused leptin in to the cerebrospinal fluid within the third ventricle of the brain. End result: Normoglycaemia. No change in blood insulin level. That's quite impressive. No, it's bloody amazing. They did a ton of other things too and had a number of excellent control groups. The conclusion the researchers reached is that there appears to be neural control of hepatic glucose synthesis and output, plus neural control of muscle glucose uptake. They're probably correct. It's a very interesting paper. But is a massive intracranial infusion of leptin genuine physiology or is it pushing a fine tuning system to its ultimate limits using a chemical gorilla? Turbocharging a Morris Minor to out-accelerate a performance BMW? They were putting almost as much leptin per minute in to the CSF/brain volume as would be produced by whole body fat mass. They probably achieved intracerebral concentrations of leptin way above what might every be produced in plasma. Of course the goal of the group is to produce a centrally acting leptin mimetic to treat diabetes. Hmmmm, the unintended consequences will be interesting! As always, picking through the results tables provides a wealth of information to be fitted in to the insulinocentric view of metabolism. It looks like STZ produces profound hypoinsulinaemia. It doesn't matter what else you do, insulin is low after STZ. No problems here. Hypoinsulinaemia across the board. 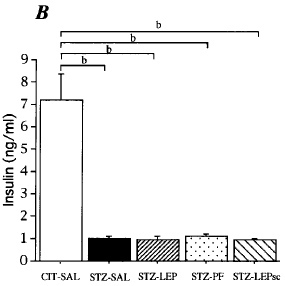 "WAT [White Adipose Tissue] had clearly atrophied in size in STZ-SAL rats. 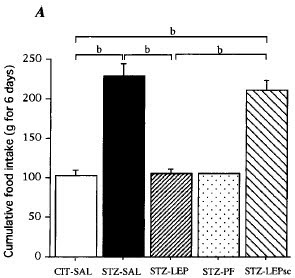 WAT in STZ-LEP and STZ-PF rats was further atrophied compared with the STZ-SAL group. For that reason, we could not extract enough RNA for Northern blotting"
So now let's look at weight change. During the 6 day experiment the non diabetic control rats gained about 15g. The hypoinsulinaemic groups all lost 15-25g bodyweight (except the semi starved group in column 4, starvation of type one diabetics is not advised, ND for leptin in the above graph wasn't that they didn't look for leptin, it's just the amounts present where below the limits of their assay). This is irrespective of whether they were spilling glucose through their kidneys or not. Hypoinsulinaemia allows lipolysis. Drop insulin and you drop fat, however much rat carbohydrate-crap-in-a-bag you eat. Intracerebral leptin does not stop this. STZ diabetic rats become hyperphagic. At least when they are fed on rodent chow and allowed free access. High carbohydrate, low fat. 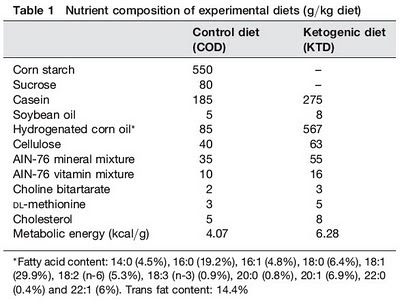 As the authors point out this does not happen if you feed a high fat diet but I've blogged about this elsewhere. I'd just like to consider why this hyperphagia should occur from the hang-glider perspective, rather than the Eurofighter perspective. STZ rats lack insulin. They do lipolysis to extreme levels and run their muscles on fatty acids. Until there is not a lot of fat left, as reflected by hypoleptinaemia. Down on the ground the cells needs calories but there is not enough fat left for this level of hypoinsulinaemia to provide free fatty acids for metabolism. But it is possible to get blood glucose levels high enough to use non GLUT4 transporters to get glucose into muscle cells (see here). With hyperglycaemia there is a chance of survival. To do this you need marked hyperglycaemia. You need it, so metabolism does its best to provide it. In fact these rats will have been hyperglucagonaemic to help raise their blood glucose. So the rats will eat a ton of glucose precursor, fail to retain it in the liver due to hypoinsulinaemia, add as much to it, using glucagon, as possible and push glucose in to muscles using the brute force of a concentration gradient. The cost is calorie loss through glycosuria and whole body hyperglycaemic damage. But death is postponed. Life is tenaceous. 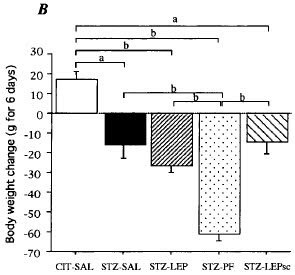 The STZ control rats ate over twice as much crapinabag as the non STZ controls while continuing to lose weight hand over fist.... Good old hypoinsulinaemia and the body's adaptation to it. The paper certainly gives support to the concept that the brain is significantly involved in glucose homeostasis. How this will relate a fat mass set point is a line of thought I'm looking forward to seeing Stephan develop. I rather like this paper. It doesn't need me to move from my insulinocentric bias for weight loss. Ah, good. Back to LC for diabetes and adaptation to high carb next. Labels: Normoglycaemia independent of insulin? We seem to have had a fair number of diabetic dogs come through work recently. Most of them have presented in ketoacidosis. This is a direct consequence of catastrophic insulin deficiency. Hypoinsulinaemia leads to unrestrained lipolysis with production of ketone bodies to the point of profound metabolic acidosis, vomiting, dehydration and risk of rapid death. Oh, and weight loss. 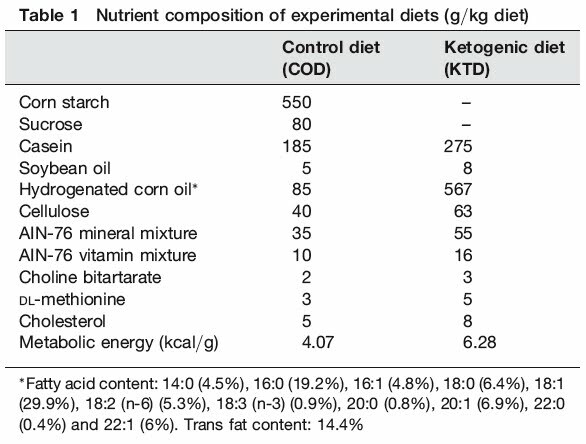 I keep reading snippets about the unimportance of insulin in the control of weight loss from various sources in the blogosphere, so it's sort of tempting to inhibit lipolysis with a couple of big, high calorie blocks of butter or maybe by an Intralipid infusion (yeugh, soyabean oil intravenously, disgusting). But, what the hell, I'm still a bit of a traditionalist on occasion, so I still shut down lipolysis with insulin. It doesn't seem to matter how much insulin you inject. Once upon a time I would have reached for soluble neutral insulin and bunged it in by intramuscular injection. I had been considering changing to using a GIK (glucose/insulin/potassium) infusion for ketoacidosis but the loss of any soluble insulin preparation from the veterinary market in the UK has stopped my thoughts along those lines. Replacing the missing insulin inhibits lipolysis first. As the blood insulin level increases it then shifts potassium from plasma in to cells. Still higher levels get GLUT4s on to cell surface membranes and facilitate glucose transport. This is utterly basic A&E work. Of course the lipolysis of weight loss might just be different from the lipolysis of ketoacidosis. I dunno. Stranger things have happened. The other thing which has happened is that I have accumulated a couple of these patients who have turned out to be unstable diabetics. They are fascinating cases. You have to understand that as a heretic I try keep my nose out of other clinician's cases, especially diabetic dogs. The basic standard veterinary approach to diabetes is to feed your patient a meal of utter crap, mostly made of sustained release carbohydrate, and cover it with an industrial dose of 12 hour acting lente insulin. Repeat every 12 hours. You can book the cataract surgery for a year's time on the day you make the diagnosis. The first patient, I'll call her Grace, is a spaniel with a two year history of dry eye, failure to produce tears. A sort of type one diabetes of the eye... What does dry eye have to do with diabetes? Dr Penny Watson of Cambridge Vet School gave a very perceptive presentation about chronic pancreatitis leading to diabetes at the 2010 BSAVA congress. In dogs pancreatitis is often a chronic inflammatory disease which can end up as a "type one like" diabetes syndrome or, alternatively, as an exocrine secretion deficiency giving a failure to digest food. Occasionally both. Which happens to occur in a given individual is probably a genetic lottery. This dog had had dry eye well before her pancreatic beta cell failure. Dr Watson pointed out that dry eye is an autoimmune attack on the tear producing glands and the attack is aimed at ductal tissue. Stem cells for pancreatic beta cells are derived from pancreatic ductal tissue, which is similar enough to tear gland ductal tissue to produce an association, both diseases in the same patient. Cocker spaniels are far more commonly affected than other breeds. She had some absolutely amazing immunohistochemistry slides. A sort of Sjögren’s Syndrome of the pancreas, probably another gift of gluten. The other patient is a middle aged terrier, let's call him William. He has a two year history of chronic hepatopathy before presenting as a type-one-like diabetic. I'd guess he has a combination of non alcoholic fatty liver disease combined with non alcoholic fatty pancreatic disease. He was on a diet of commercial ultra crap, rice mixed with a mess of enzymically degraded protein to limit pre existing skin allergies. Imagine trying to catch the glucose spike from a bowl of white rice with a slow onset sustained release insulin. That initial spike of blood glucose was being caught, too late, with an enormous dose of lente insulin. Two hours later he would have a blood glucose of around 10mmol/l, but dropping like a stone. Suddenly the next reading would be back above 30mmol/l. Dr Bernstein doesn't have a lot of time for the Somogyi overswing. I do, certainly for this dog. The liver is loaded with glycogen, it panics and dumps a fair dose of glucose to (over) correct the incipient hypoglycaemia. With the standard management approach both dogs had immediately come out of ketoacidosis and had gained weight over several weeks. Did I mention that insulin inhibits lipolysis? Ok, I'll drop it in to casual conversation again. Insulin inhibits lipolysis. Weight gain? Now there's a surprise. Of course there is no ketosis but also no suggestion of normoglycaemia at any stage of a 12 hour glucose curve either. For some reason Grace had been dropped in to the middle of an afternoon consulting session for a random, post absorptive blood glucose check with me, presumably to adjust her insulin dosage. I wasn't her clinician. I think this reading was somewhere around 25mmol/l. She was ravenous, depressed and polydipsic. Next morning I had her admitted, halved her insulin and fed her a can of cat food with a carbohydrate content of approximately zero, except whatever cooked liver was in the can. The curve came down from somewhere over 35mmol/l to about 14mmol/l and stayed there. We've incremented her insulin up and are aiming for peak blood glucose below 10mmol/l and post absorptive levels below 7mmol/l. Probably the best we can do with lente insulin. William came to me because lente plus ultracrap was giving completely random blood glucose levels. His owner had been offered referral to an endocrinologist or to see the weird in-house vet who didn't feed sugar to diabetics. That's me. They chose to see me for some reason. He behaved similarly to Grace when fed all meat cat food and half dose insulin, which is good but we probably need better glycaemic control if we are going to get his hepatopathy to halt. We're getting post absorptive glucose levels between 5mmol/l and 7mmol/l but there is a post feeding spike to over 14mmol/l, which suggests there is a lot of liver in the cat food to provide significant glycogen in the diet. But so far he's a lot more stable now than he ever was on ultracrap. So why low carbohydrate? Why not simply adjust insulin to cover normal diabetic crap-in-a-bag? This comes down to the difference between exogenous insulin and pancreas secreted insulin. Let's recap the two main functions of insulin. First is the inhibition of lipolysis, I may have mentioned this before. This bit is easy. The next is the suppression of glucose release from the liver. This is utterly core to normoglycaemia. This is not quite so easy. This is because insulin is normally produced by the pancreas and it travels directly to the liver. There is first pass metabolism by the liver, lots of it. The liver extracts between 50% and 80% of all of the insulin produced by the pancreas. Relatively little ever gets to the systemic circulation. This residue is what should be controlling adipocyte function. If we turn this on its head we can say that we need to provide relatively high levels of insulin by subcutaneous injection to achieve those levels at the liver which would normally be delivered from the pancreas. But we end up not just bathing the liver with this specific high concentration of insulin. To reach "pancreatic" concentrations at the liver, from a subcutaneous injection site, we will have to hit the adipocytes far harder than we want to. We might well achieve adequate control of hepatic glucose output but at the cost of suppressed lipolysis. Weight gain. And hunger of course. You could add in a third role for insulin as the management of dietary carbohydrate, ie portal vein glucose sequestration in to the liver and its metabolism by muscles when it spills over in to the systemic circulation. Generally I regard this as what Douglas Adams described in the Hitchiker's Guide to the Galaxy as an SEP. This is a "Somebody Else's Problem". You want to do that? Fine, you sort out the mess. I really have to discuss this in some detail because it is perfectly clear that non diabetic humans, so long as they have a functional physiology, can generally deal with massive amounts of carbohydrate rather well. So well that they can lose weight, rather a lot of it, by eating a diet of potatoes alone. This perfectly compatible with why LC is the logical and necessary approach to diabetes. That needs a separate post with a few links to pubmed rather than me rambling on about how I earn my living. I have net access again, broadband rather than a mobile phone dongle with intermittent connection that would only talk to my wife's PC because my mac has not needed any sort of system update since a very long time ago! Posts are coming and I'll try to do something with the pile of comments which need moderating with some attention and a whole stack of emails too. Woo hoo, click and page loads, no 10 minute wait, that's good!